Bacharach recently released their new Fyrite Insight Plus combustion analyzer. The Insight Plus offers some valuable improvements to the already very popular Insight series. The Insight Plus can view combustion analysis data graphically, providing technicians a better understanding of what’s happening over time, or how close to certain limits a unit is operating. The Insight Plus is built around Bacharach’s self calibrating and field replaceable B-Smart CO sensor. The CO sensor now measures to 4000 ppm, and comes with an integral NOx filter. A 3-year, long life O2 sensor is also available as an option. The Bacharach Fyrite Insight Plus can store 100 measurements in memory to be recalled, printed, or downloaded. The Insight Plus has a full color, brightly backlit display that can graph live combustion data in two ways. On the Line Graph Trend Screen it graphs a user selected combustion parameter over time, providing an understanding of how the parameter is trending. Monitor CO levels over time, for instance. On the Bar Graph Screen, the Insight Plus shows 3 bar graphs which monitor 3 customizable parameters with user defined limits. Users can simultaneously view O2, CO, and T-Stk, or any other available parameters. A third graphic screen, the Stack Temperature Hot Spot Screen, offers an innovative way to detect the ideal measurement spot within a testing location. The new Bacharach Fyrite Insight Plus brings new features and flexibility to residential and light commercial combustion analyzers. 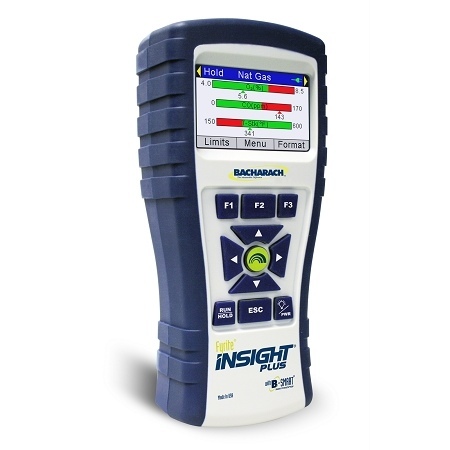 To the HVAC contractors, home inspectors, maintenance personnel, and energy auditors who count on quality measurement day in and day out, the innovation of the Bacharach Fyrite Insight Plus will be a welcome addition. For more information on the Bacharach Fyrite Insight Plus, give us a call at (877) 273-2311, or see the product specifications at IvyTools.com.